A long time ago in a galaxy far away…..
Scratch that. 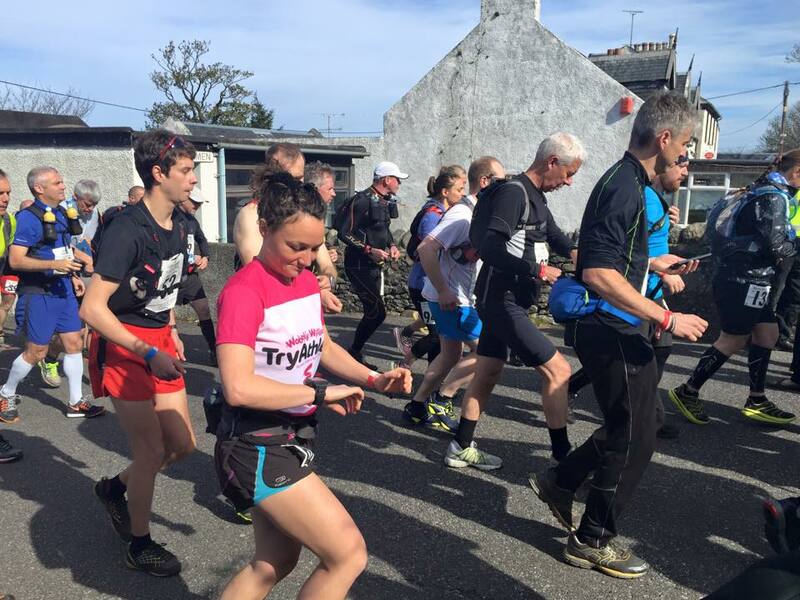 A few months ago, in a town not so far away, Julia from Girl Runs Wild and I had an on-line chat about her running the Kintyre Way Ultra. I jumped at the chance of supporting her with this, and crewing for her on the day. Julia is an experienced ultra-runner, and I was quite excited to catch a glimpse into the world of ultra running. Julia had hoped to have a trip through before hand, but for various reasons, wasn’t able to, so the week leading up to the race was quite exciting, given that she’d be staying with us for a few days, and we’d only ever chatted on line. Well, it turns out that Julia is a lovely person, and a brilliant house guest – she is welcome to stay with us any time! She arrived on the Thursday before the race, and we had a good chat about lots of stuff – including what support Julia would need on Saturday. On the Friday @TheWelshWookie and I had to work, but it turns out that Julia has some friends very close to Tarbert, so she was able to have a look around Tarbert, and visit her friend Mary and her horses. 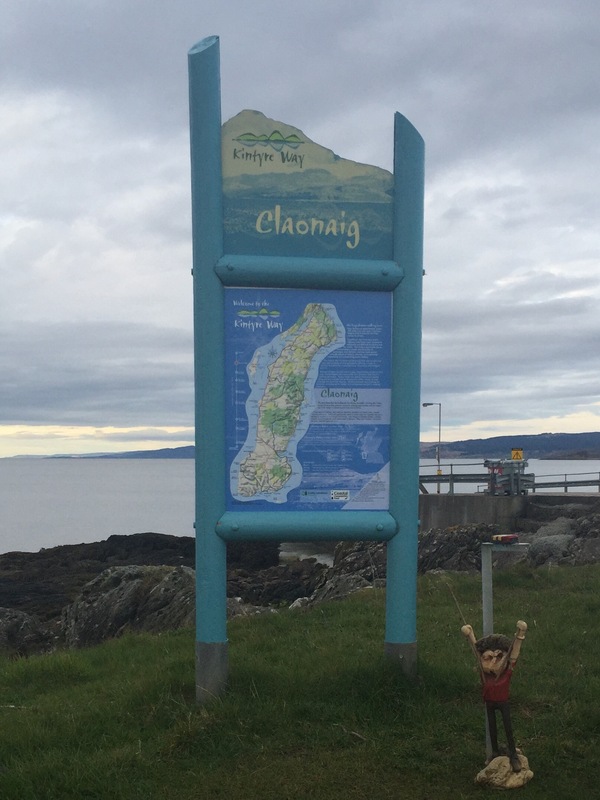 When @TheWelshWookie arrived home, he was accompanied by a new ‘friend’: Wee Mull, who is the official mascot of the Kintyre Way Schools. 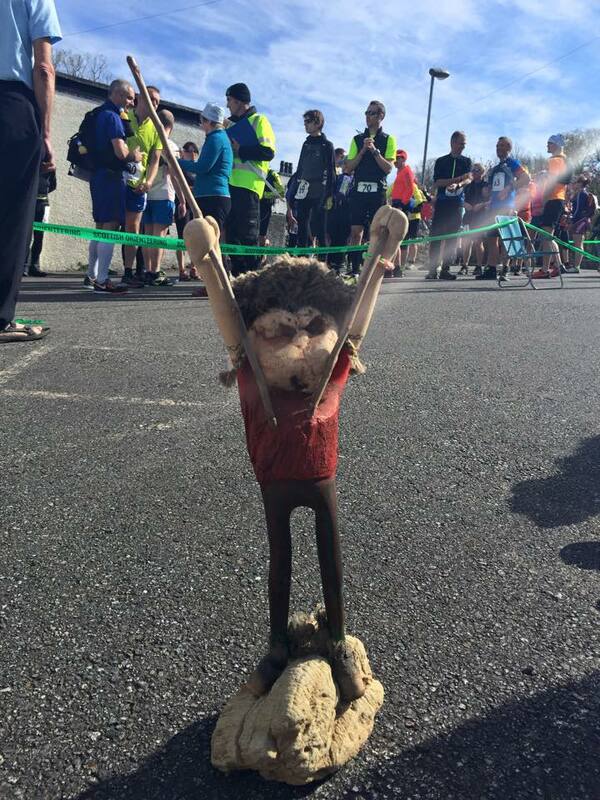 The pupils in Tarbert Academy had asked @TheWookie to take Wee Mull around the Ultra race, since it is run along the route of the Kintyre Way. 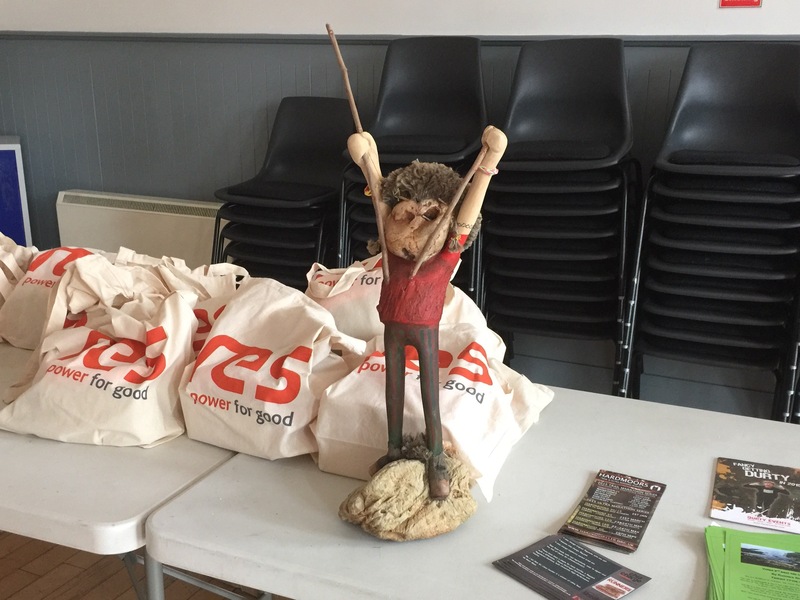 He’s made of rocks and wood, so he’s very eco friendly, and very heavy! We headed down to the village so that Julia could check in. She collected her bib and her ‘dibber’ and also her goodie bag. Apparently, most goodie bags are given out at the start of ultras, due to the higher drop-out rate. The participants got a fabric bag containing a fluorescent orange beanie, a Kintyre Way buff and a coffee mug. We then headed to the Café for dinner – and an excuse to carb load. It was then time to head to bed early, as we were manning the first check in point, at Claonaig, and we had to be there for 6.45. At 5.45 in the morning, @TheWookie phoned Rob, the race organiser, to get on update on the runners. 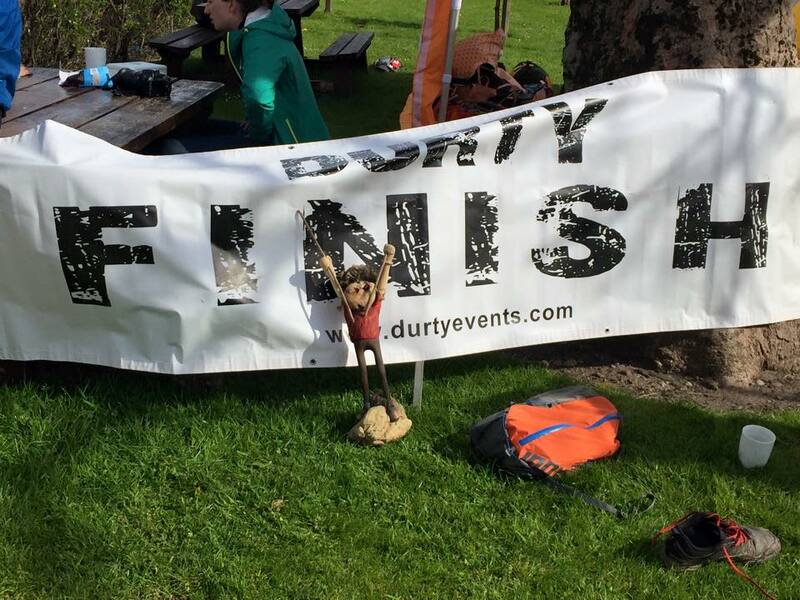 There are two race options – a 67 mile event, and a 35 mile event. Either can be run as an ultra, or as a relay race, with relay runners changing over at the checkpoints. Julia was running the 35 mile run, but we were manning the checkpoint for the 67 mile runners. 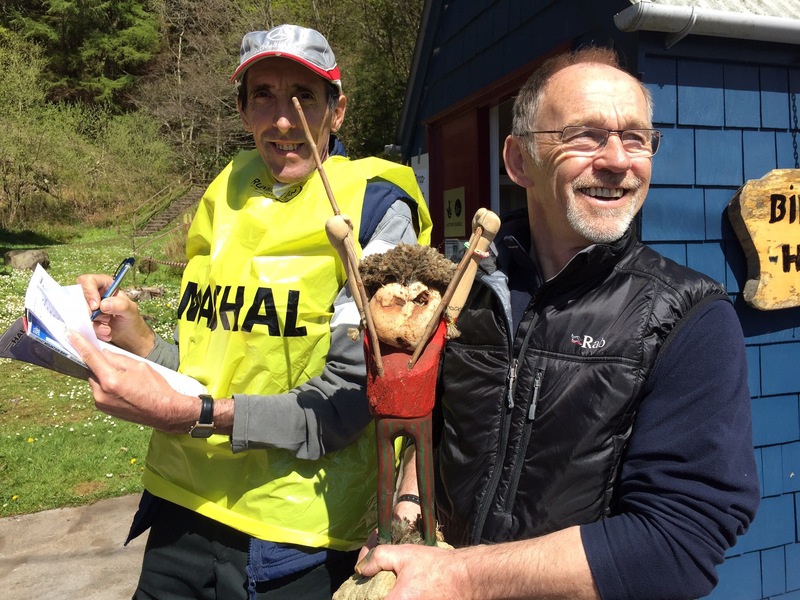 Overnight, there had been a few withdrawals, and others who had switched to the 35 miler. There were 13 individuals, and 6 relay teams doing the longer race. The morning was cold, but the forecast was good, and as we set up at Claonaig, the sun started to break through. 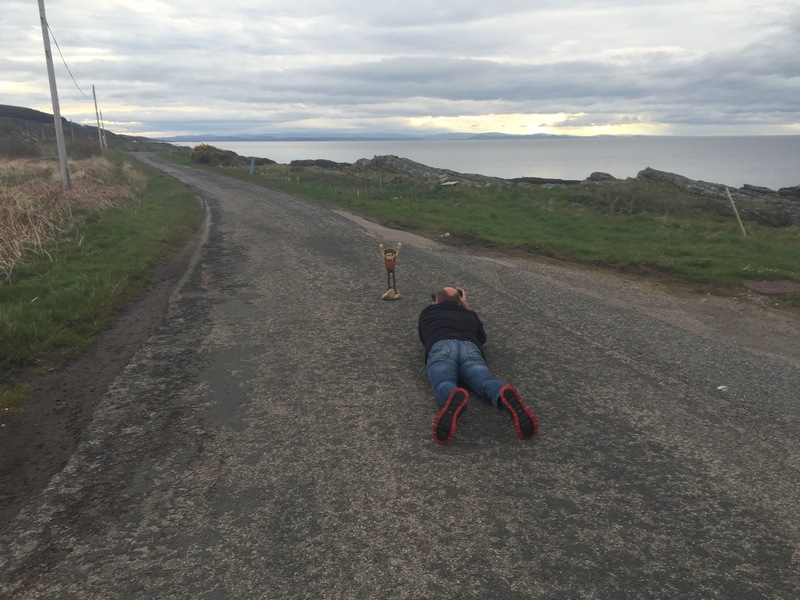 Wee Mull had great fun, having his pictures taken by the professional photographer who was there to capture the runners during the race. The first runner came through at 7.07am, which was a record-breaking time at that stage. He looked so comfortable, having already run over muddy, hilly terrain for 11.5 miles! 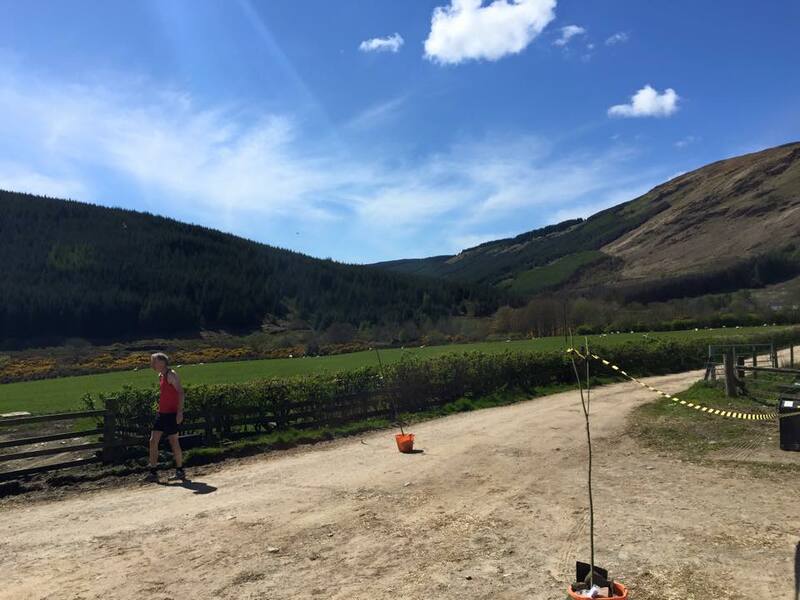 Within half an hour, all of the runners had been through, including Fee from Inveraray (who organised the Inveraray Jail Break last Sunday). Fee was running the relay, and looked great as she handed over her dibber to Liz. I was so excited, and really enjoying the buzz! The final relay team were late: their runner picked up an injury, which meant that they were in a bit of bother early on. Because we had to collect Julia, we left Ann, who was the other time checker at checkpoint 1, to check him in and to phone through the times to Rob. @TheWelshWookie and I jumped back into the car, and drove the 20 minutes back home to collect Julia. She looked relaxed, but prepared, and ready to run. We all hopped straight into the car with Julia’s gear and drove down to Tayinloan, the start point for the 35 mile run. On the way, we passed runners heading into and out of Clachan, which was the location of the second checkpoint, and the only checkpoint that we – and Wee Mull – were not visiting. 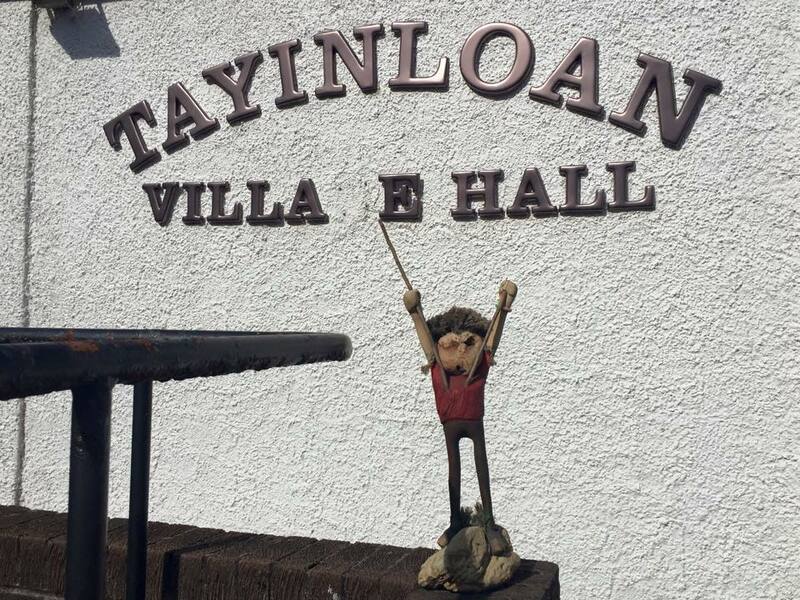 We arrived at Tayinloan Village Hall at around 9.45, which was perfect for the start time of 10am. Julia pointed out some other runners she knew, and then the runners were called individually into the starting pen. There was just time for the race briefing, and it was time to go! 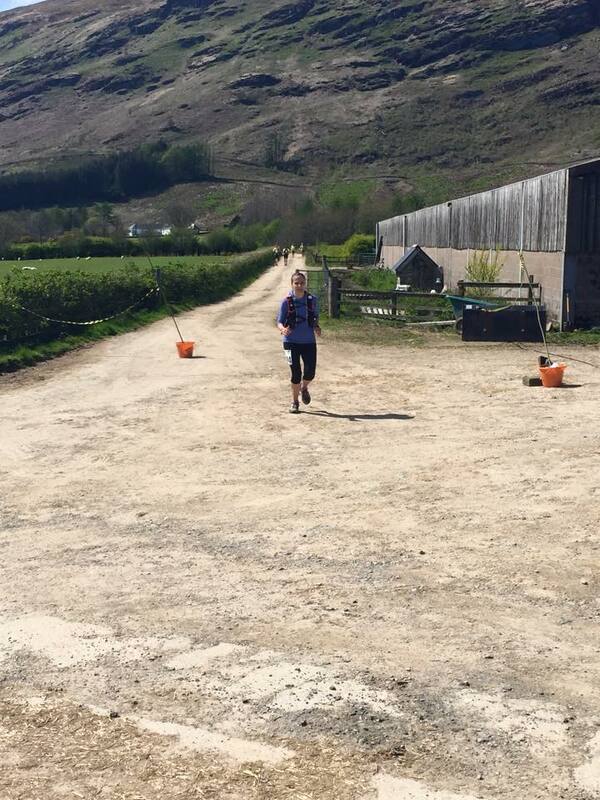 We knew that Julia was hoping to reach Carradale in around 3 hours, so we stayed at Tayinloan for a while, cheering on the 67 mile runners as they arrived. 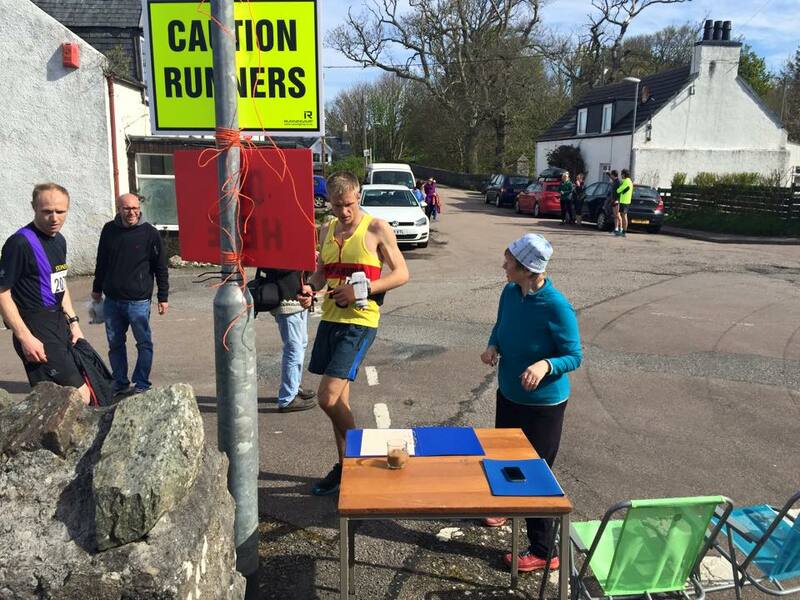 Ian, who was in the lead at Claonaig, was still in the lead, and reached Tayinloan at just after 10am, not long after the second race had begun. He still looked very relaxed and comfortable! 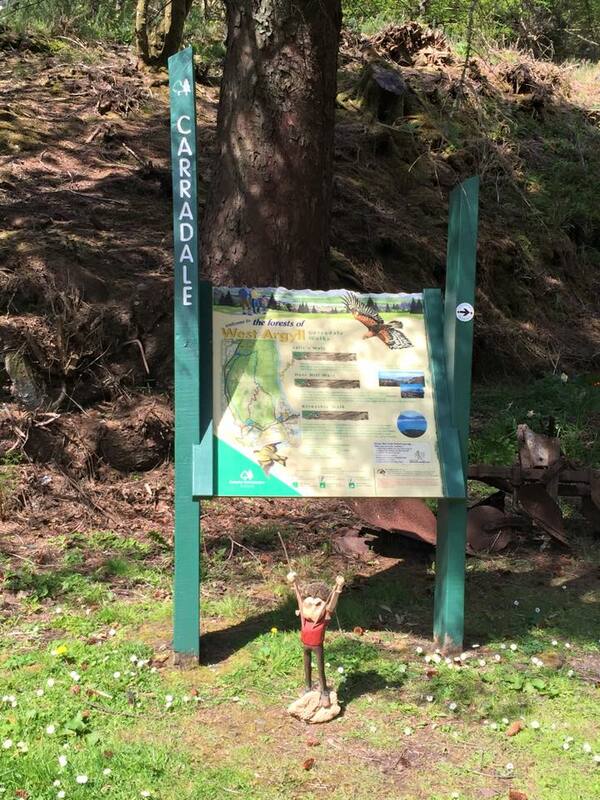 @TheWelshWookie, Wee Mull and I then drove around the peninsula, and into Carradale. When we got there, it was already buzzing with excitement, and the first 35 mile runner was just passing through as we arrived! 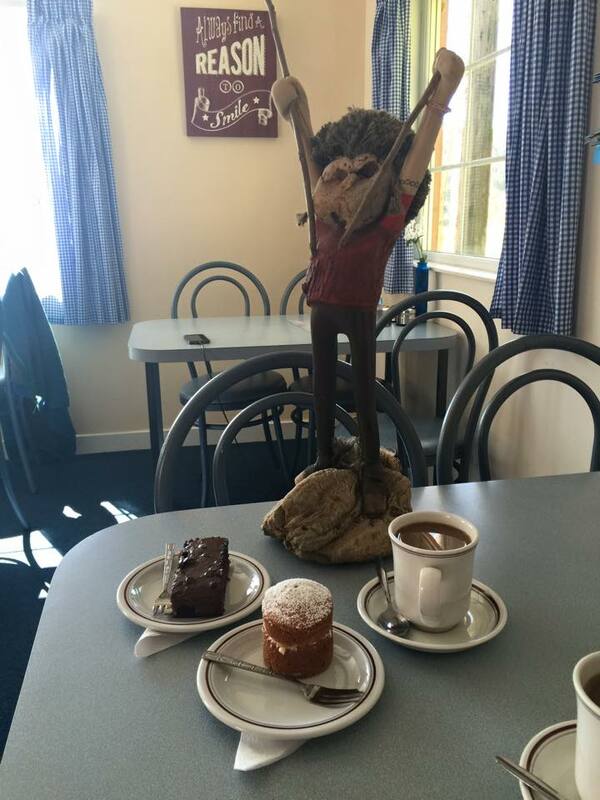 We had some coffee and cake in Carradale Network Centre – it was delish! And then we mingled, chatting with runners and other volunteers. While we waited for Julia to arrive, we helped other runners: we chopped fruit, put rubbish in bins, provided suncream (it was hot and sunny!) and filled up water bottles. It was great! At under 3 hours (2 hours, 52 minutes to be precise), Julia arrived. She was looking relaxed, and was running well. We refilled her water, sorted out her food for the next section, and chatted a little. 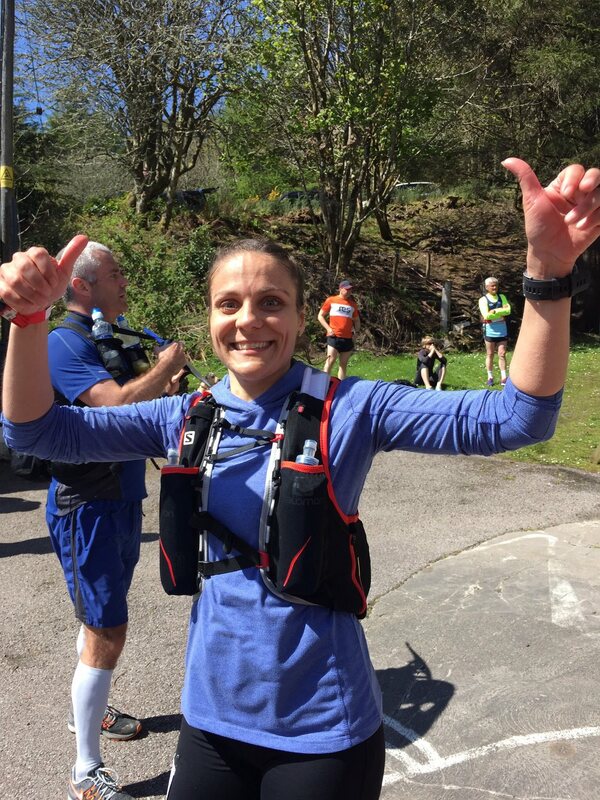 She had really enjoyed the run – it was hilly, and not too muddy, and all in all she was feeling good. Julia headed off, and we packed Wee Mull back into the car, and headed to Ifferdale. 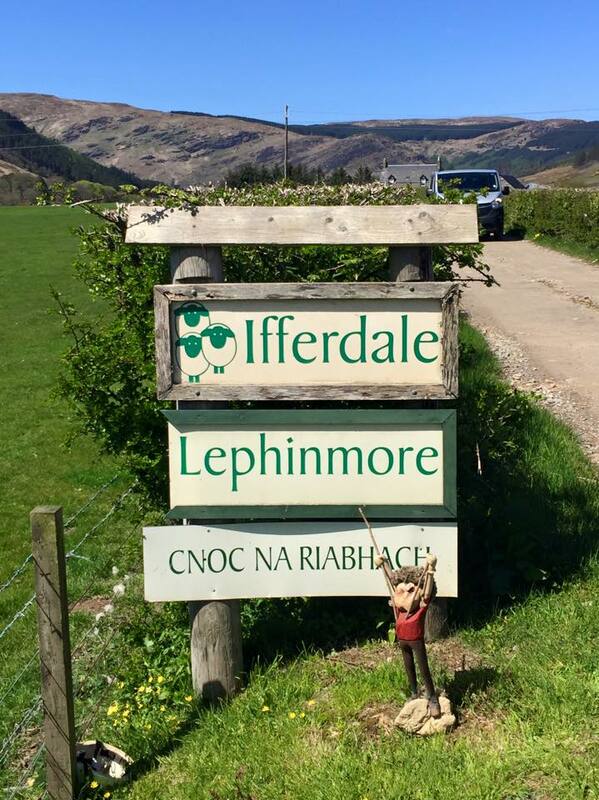 Now, Ifferdale is a farm off the main road, so we were advised to park in Saddell and walk, which we did. It was a good 1.5 mile walk along a farm track, in beautiful sunshine. I carried Julia’s gear, while @TheWookie carried Wee Mull. On the way, I spotted a huge bird of prey (no idea what it was) and I heard a cuckoo – it was so peaceful! Ifferdale was quieter than Carradale, but definitely still buzzing! 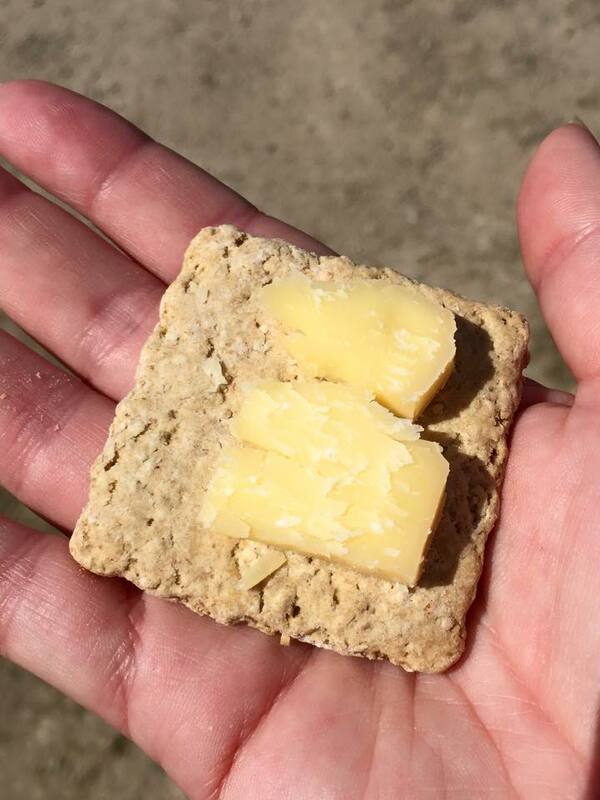 We chatted to other support crews, and we were treated to cheese scones and oatcakes with Mull of Kintyre Cheddar from the farm owners – yum! We cheered on the other runners as they arrived, and then Julia appeared. Julia was struggling only a little, with some ab pain, but she was still running well She paused this time for a short while to refuel, while we filled up her supplies and water. Then, it was time for her to head out on the final section. Julia asked us to meet her again at another part with some fresh fruit if we could – it was hot, and a good way to take on some extra fluids, so that was our plan. 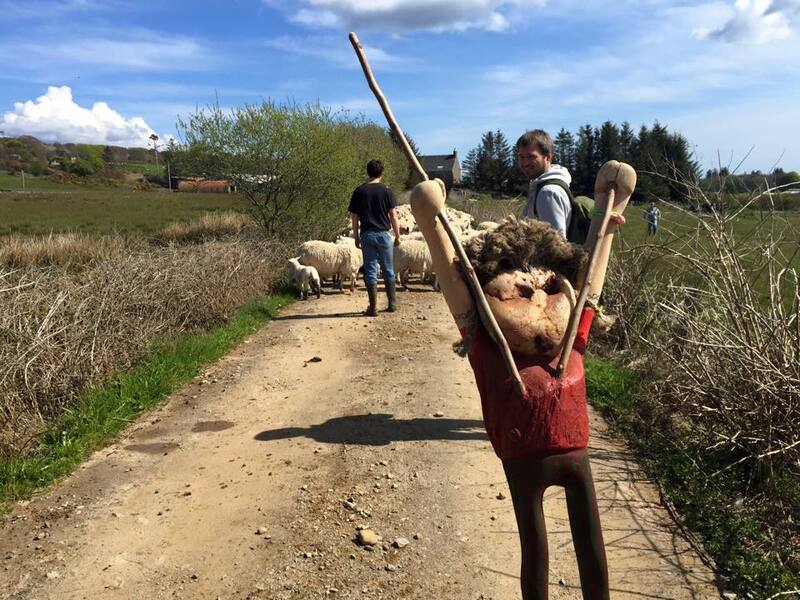 We headed back along the farm track to get back to the car – and found gridlock! There was a flock of sheep in the way, while they were being shepherded into another field! There was nothing at all we could do but wait. 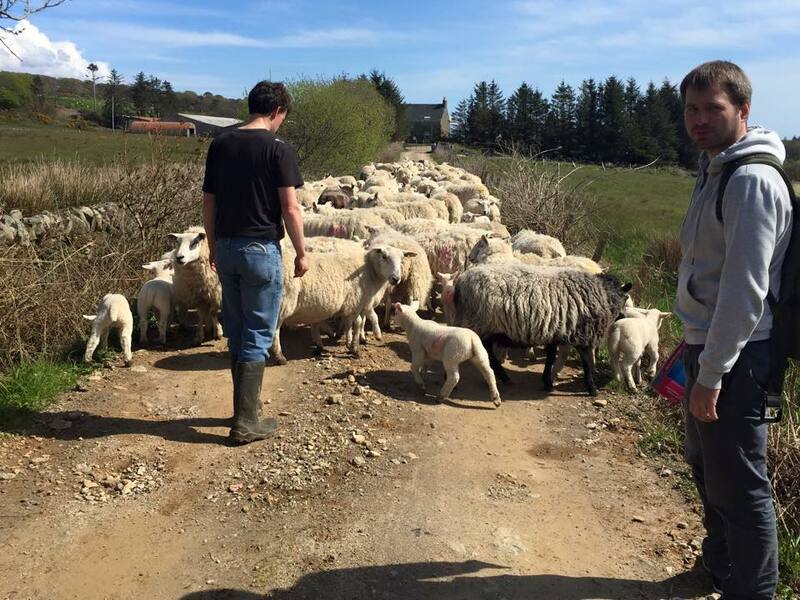 The lambs were too cute – and it was fascinating: watching the sheepdog round them up and keep them in check. Eventually, we made it back to the car. We drove into Campbeltown, headed to Tesco, and stocked up on pots of fresh pineapple. 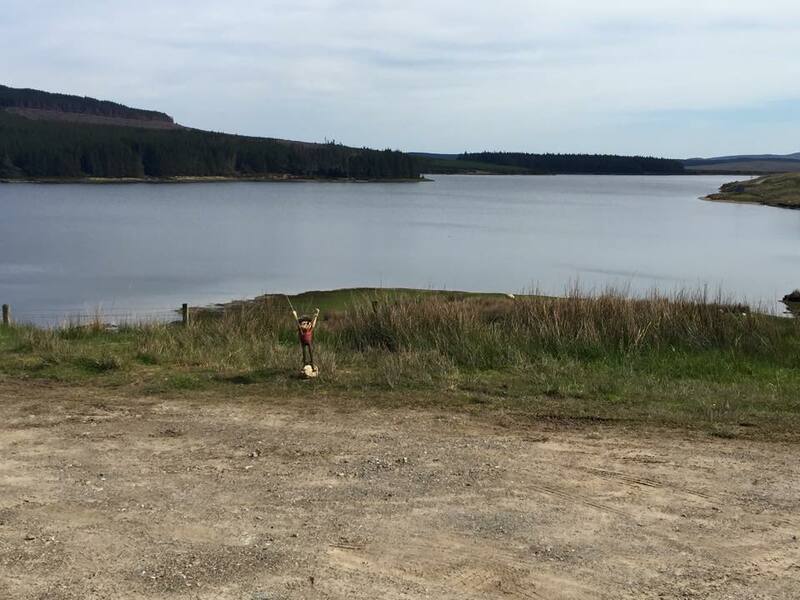 We then drove out of town and up to Gobagrennan. The road was pretty good, so before we knew it, we were at Loch Lussa, which was beautiful. All along the road, we were passing runners so we had the windows down, and we cheered them as we passed. As soon as we got to Loch Lussa road end, Julia arrived. She was feeling much better, and felt good about finishing. She had some pineapple, and then headed out for the final part of the run. 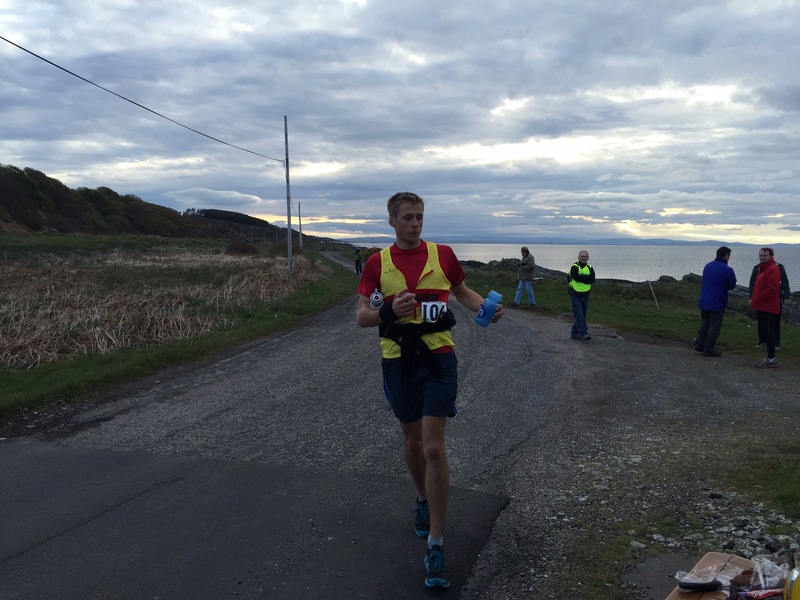 We helped out a few more runners, before heading back to Campbeltown and to the finish line. 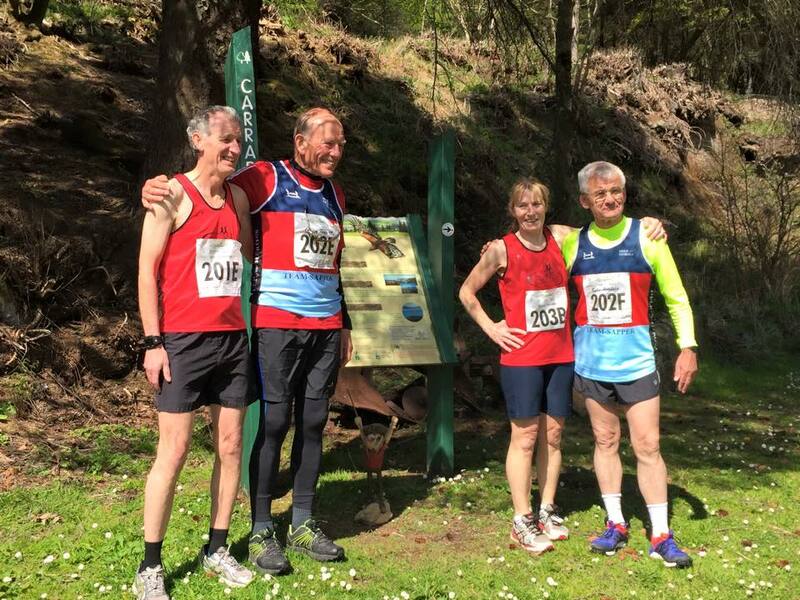 When we parked up and arrived at Campbeltown, there were a few of the runners who had just finished – including the course record breaker, Ian Docwra. We had a coffee, and chatted to others, and we also cheered and clapped the finishers over the finish line. Given that we knew how Julia was running, we had a rough idea of when she’d finish. But, she surprised us a little, and suddenly she was running for the finish line. She had completed the 35 miles in a fantastic 7 hours, 29 minutes, and more importantly, she was feeling good! On Sunday morning, Julia was feeling pretty good, which was fantastic. 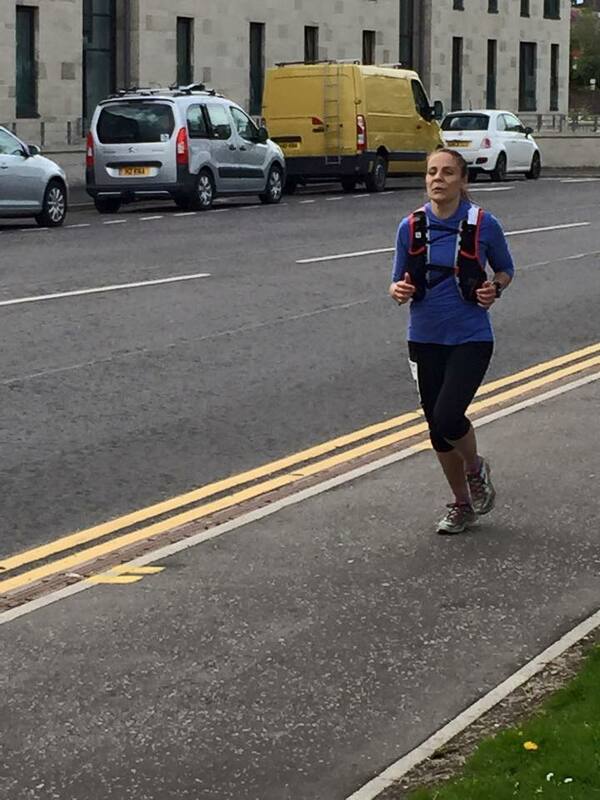 We had what Julia called a short shake out shuffle – I called it a decent wee run for us! And, we finished the weekend off with a muscle relaxing soak in the hot tub. I had a fantastic time. I was really impressed with every runner’s dedication and determination. I was surprised at the whole atmosphere: it was so relaxed, fun and supportive, both from the runners and from the support that was at each checkpoint. 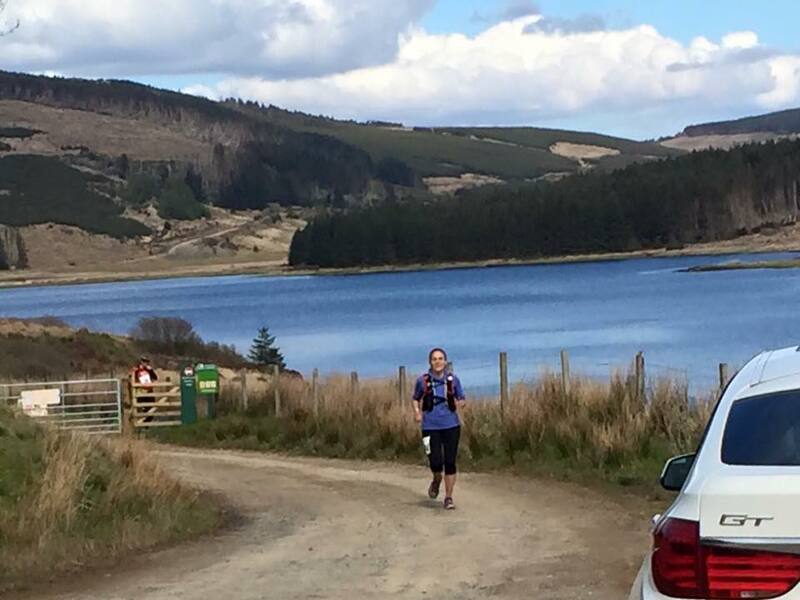 I had thought that ultra running would be more intense, less fun – but the opposite is true. Everyone looks out for each other. Everyone cares how one another are doing. The support and the volunteers were all fantastic. I really felt like I was part of something special. Wow, looks like an amazing event! Congrats to Julia! It was so much fun, and Julia was a fab house guest 🙂 Hope you had a good catch up!